In response to the devastating Northern California Camp Fire, the Homes for Heroes Foundation awarded a $25,000 grant to the International Association of Fire Fighters, or IAFF Disaster Relief Fund. All funds will be used to assist CalFire firefighters who were eligible through the IAFF Disaster Relief Fund. 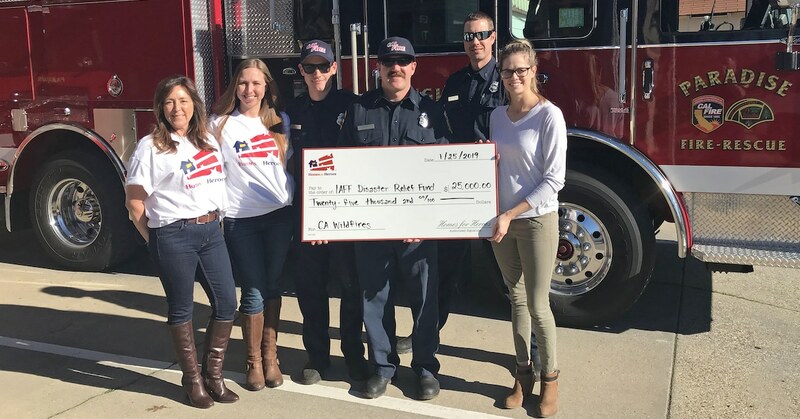 Homes for Heroes affiliate real estate specialists, Kendra DiGrazia and Tiffany Isabell of Chico, California, presented the grant check to the CalFire station in Paradise, CA. Along with Janet Sauneir, Homes for Heroes affiliate real estate specialist all the way from Jacksonville, Florida, mailed hand-written thank you letters from students in her community to the CalFire firefighters. Firefighters and EMS are on the frontline serving their communities when there’s a national emergency or natural disaster. When these first responders and their families are victims of these events, or when they experience a loss, the IAFF Foundation provides disaster relief. Some of the types of relief coordinated by the IAFF Foundation include, but are not limited to: financial relief, food, water, clothing, shelter, medical aid, and behavioral health counseling. Fallen fire fighters may leave a family behind. The IAFF Foundation may also provide the kids of fallen IAFF members with a scholarship. Each year they help 40 students pay for post-secondary eduction. November 2018 recorded the deadliest and most destructive wildfire in California history. It originated on November 8, 2018 Butte County until it was officially contained on November 28, 2018. It was named, “Camp Fire” after Camp Creed Road, the reported place of origin. The fire led to 86 casualties, seventeen non-fatal injuries and three missing persons. It burned over 150,000 acres and destroyed nearly 19,000 buildings. The total cost of damages is estimated to be $20 billion. The disaster also put strain on local medical facilities and healthcare professionals (also heroes we recognize for their service) as they experienced an influx of patient injuries and spillover from neighboring communities. Many people were directly impacted by this horrible devastation, and they are trying to get back to their lives, back to normalcy. Its estimated roughly 9,400 firefighters battled this inferno according to California state officials as reported by Mihir Zaveri of the New York Times. The Homes for Heroes Foundation grant of $25,000 will be used by the IAFF Disaster Relief Fund to specifically assist CalFire firefighters eligible for the IAFF Disaster Relief Fund. The check was presented by Homes for Heroes affiliate real estate specialists, Kendra DiGrazia and Tiffany Isabell, both out of Chico, California. In addition to the grant, Homes for Heroes real estate specialist, Janet Saunier out of Jacksonville, Florida presented thank you letters to CalFire fighters from her local community students to thank them for their heroic acts and dedicated service. The Homes for Heroes Foundation assist heroes; firefighters, EMS, law enforcement, military, healthcare professionals and teachers who are in need of housing or emergency financial assistance. Donate today to assist our American heroes.